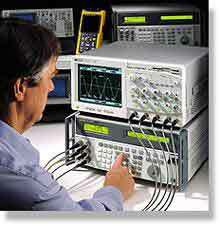 Fluke Corporationscilloscope Calibrator quickly calibrates most digital and analog oscilloscopes. It allows the user to meet the manufacturer's calibration requirements for oscilloscopes up to 600 MHz. With its high bandwidth option, it's performance can be extended to oscilloscopes up to 2.1 GHz. The five-channel output option facilitates hand-free automated calibrations. Options can be added at any time. , P.O. Box 9090, Everett, WA 98206. Phone: 800-44-FLUKE; Fax: 425-356-5116.